The Golden Sands Dairy operation proposes to use 7,838 acres of property and will include a 5300-cow dairy. The nearly 8,000 acres is comprised of 6,640 acres of irrigated agricultural crops; 98 acres for the dairy facility and 1280 acres of buffer. Approximately 6000 acres of this is located in the Town of Saratoga and more than 4,600 acres is currently managed pine forest that will be clear-cut to accommodate vegetable and forage crops. This acreage will require continuous irrigation and will be fertilized by the spreading of nearly 55 million gallons of liquid manure and 25,000 tons of solid manure each year. The Town of Saratoga is listed on the US Geological Survey map as an area highly susceptible to groundwater contamination. The main aquifer consists of glacial sands and gravels resting approximately 20 feet below the land surface. The public health standard for nitrate levels in drinking water is 10 parts per million (ppm). 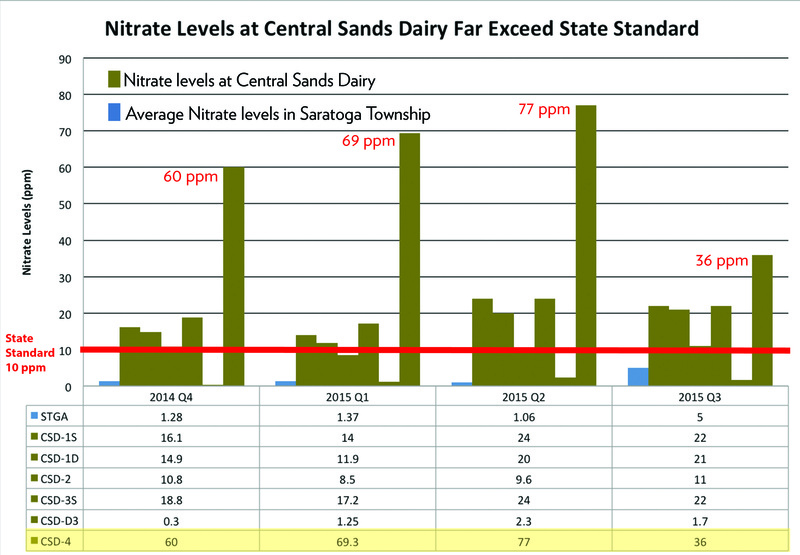 At the nearby Central Sands Dairy, also owned by the Wysocki family and located on similar geology, the nitrate levels in the groundwater from at least one well have risen to as high as 88 ppm in just a few years. All of the wells at the Central Sands location are demonstrating levels well above the public health standard. There are nearly 500 residential wells in proximity to the fields on which Golden Sands Dairy proposes to apply its liquid waste. Some 1300 acres of cranberry bogs, that depend heavily on a clean and plentiful water supply, lie within five miles of the dairy’s proposed site. The bogs are highly sensitive to potential changes in both stream flow and groundwater table elevation. These bogs generate approximately $15 million in annual revenue and are a critical driver in the area’s economy. The Town has installed a ground water monitoring network to establish a baseline for water quality and quantity. The Golden Sands Dairy proposal includes 31 high-capacity wells that are grouped into 6 well systems. As proposed, the wells would be permitted with a capacity in excess of 40 million gallons of water per day. In multiple and concurrent dry years the reduction in stream flow could be up to 100 percent. In multiple and concurrent dry years, water use at this capacity is also expected to reduce levels in nearby residential wells by as much as several feet.